I’ve had a manic weekend, painting frames, framing paintings and generally readying myself for Childwickbury Art Fair next weekend. It will be great to be there and also to get away from here as it’s Grand Prix weekend down the road at Silverstone….noise and traffic jams! No post tomorrow as Floss and I are going on our annual pilgrimage to the BP portrait award – great stuff and I get to see a David Jon Kassan painting in the flesh. Here’s a portrait of a mustard pot! I had no internet yesterday but was busy painting in the studio and down the lane. This was a rare “from a photo” painting because I couldn’t take my paints to Ireland last week. It was an overcast day, much like today, so not fantastic light but I liked the snaking river. Clonmacnois is where my grandparents are laid to rest and is a heritage site, where a monastery lay being the first university. This is going off to Ireland to my lovely cousin Patty who looked after us in her lovely home. Thanks Patty! A taste of England. This is also available as a print. Hope you all have 5-7th July in your diaries. At least those who would like to visit a great art fair. Just as I had put in a new order for paints, I had word from Jackson’s that I was on their latest blog. Spooky. Please give me a like, retweet or a share! 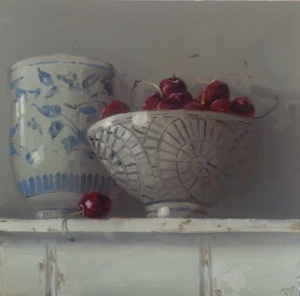 In the meantime, more cherries. Back in the studio today after a wonderful weekend in Ireland for a gathering of the clan. And what a large and wonderful clan it is, most warm and hospitable peeps. The occasion was the visit of a cousin from Australia whose mother left the family home in Ireland at only seventeen years of age as many of them had to do in those days. Two brilliant days culminating in the visit for us all to Kileen’s pub which, in true Irish style, doubles up as the village store. You can sit at the counter and sup your ale between the Brillo pads and the grapefruit segments. On one high shelf is a box marked “ladies and gents habits” which is what you’re buried in. A late night! Great fun, thank you all to my Doolans family. Exhausted today and feeling the need to rest my vocal chords. Here are some cherries. Well here’s a taste of Pakistan. Peaches from the Swat valley which are drippingly juicy and in abundance in June. Buying and eating fruit in the country of origin makes such a difference to the taste. Busy morning this morning with lots of visitors and paintings sold. In between I had my haircut and packed for weekend in Ireland, visiting family. Have a great weekend, doubt I can blog tomorrow. I couldn’t blog yesterday as my website was being worked on but everything is ticketyboo now. I went out painting yesterday evening in the glorious sunshine which was a joy but more in that later. I need to find a poppy field nearby to paint for a WW1 commemoration exhibition coming up. Anyone know if one? Oh it’s good to be home. The garden looks like a jungle, the house looks like Miss Haversham’s and the fridge is empty but I’m a happy bunny. I’m hoping to get out and about painting later but here are some plums in the meantime. Busy packing with just enough time to squeeze this one in. I’d been missing the wallpaper. Sorry the photo is slightly out of focus but you get the general idea. Sometimes, I seem to paint a subject that people love and aubergines seem to be one of them. More troubles here, more people killed…….I’m looking forward to some peace and calm when I get back but many here don’t have that luxury.